AER 49 examines the issues raised by the ACER Research Conference 2005: Using Data to Support Learning. It analyses the conference papers, distils the essence of the conference 'conversations', and contextualises them in the light of a survey of the broader Australian and international literature on using data to support learning. Section 1 sets the context by providing definitions and an organisational framework. Section 2 discusses some purposes for collecting and analysing educational data, and considers the role of data in professional work. It addresses issues associated with identifying potential data sources, including consideration of the decision-making required to locate appropriate data. Section 3 records what the research says about how data can be used to support learning, and notes recurring themes. 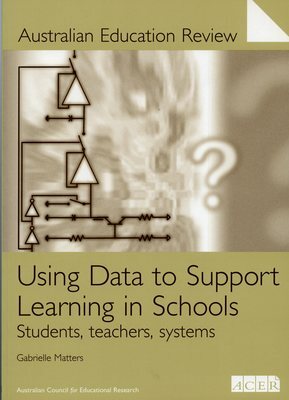 The identified themes revolve around the role of data in the interrelationships built by schools and the system; teachers, classrooms and schools; and teachers and students. Section 4 identifies and comments on four apparent dichotomies in our current discussions about data and evidence, and suggests some alternatives for operating more effectively. In conclusion, Section 5 sets out implications for policy and practice of the methodological, strategic and ethical aspects of the issues discussed in earlier sections.